…they had the whole cast singing the word fly instead of flee except I think they forgot to tell Michael Kitchen because the camera was on him in close-up when that line was being sung and you see his mouth form the word flee when the whole rest of the singers are singing the word fly. I guess he just sang it the way he learned it and nobody edited it out or reshot it. He does seem to be the only one not singing from a hymnal. In her first credited role, Emily Blunt got to act opposite Michael Kitchen and wear a nifty beekeeper’s outfit. Amazing that the real experts in beekeeping require little in the way of protective wear, even when dealing with a swarm of 40,000 bees. The questionable professional ethics of Foyle’s ride companions are on his mind while they zip through the pastoral surroundings of Hastings in War Games and the austere streets of London in The Eternity Ring. Professional ethics certainly don’t concern Trump and his appointees as they daily violate with little repercussion the rules and laws governing their offices. Foyle silently observing Simon Walker. 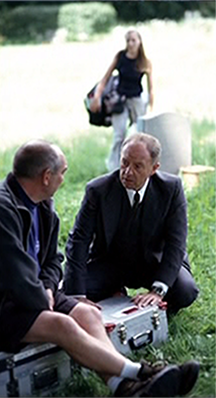 The scenes with Foyle and Guy Spencer are particularly powerful examples of Michael Kitchen’s “facial expressivity…conveying what is felt in the act of repressing feeling”. When someone gets in your way, you have to act. That’s the genius of Hitler. In a way, that makes him the greatest businessman of all. Mr. Trump’s decision to call Mr. Reynolds is a reflection of what his supporters find appealing: his willingness to do something himself when he thinks it needs to be done. A potential Hitler on our hands if we’re not vigilant, even though Tr*mp is hardly a great businessman. Foyle requires an explanation from his friend, Stephen Beck. This very British series is a police procedural set in Hastings, England, during World War II. 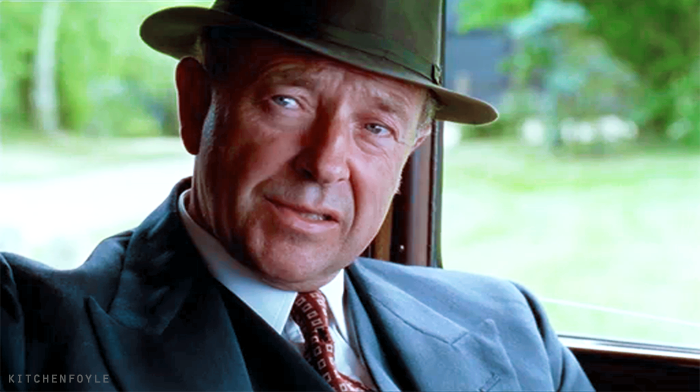 But it’s also about Christopher Foyle (played by the great Michael Kitchen), a good cop and a great man, who always manages to do the right thing, even when bending the rules might seem like the expedient thing to do. A prolonged ode to integrity seems like it might be useful viewing these days. How do I love this scene. Let me count the ways. 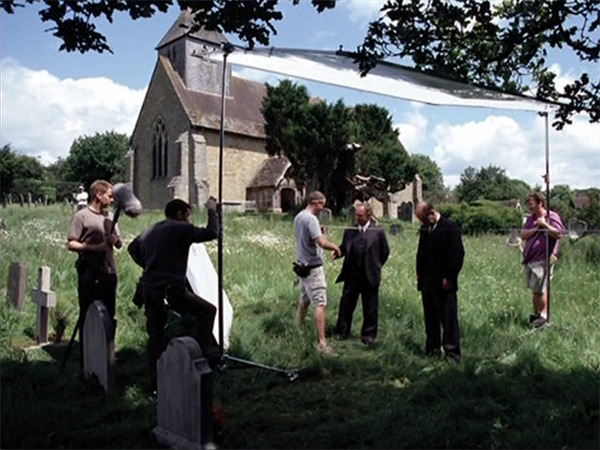 Lapels waving in the breeze, contemplative close up, understanding between friends, wildflowers, quaint village church, Michael Kitchen, Alan Howard. Foyle doesn’t take kindly to his subordinates perverting the course of justice. Commemorating Earth Day with an adorable face and an abundance of bright green leaves. 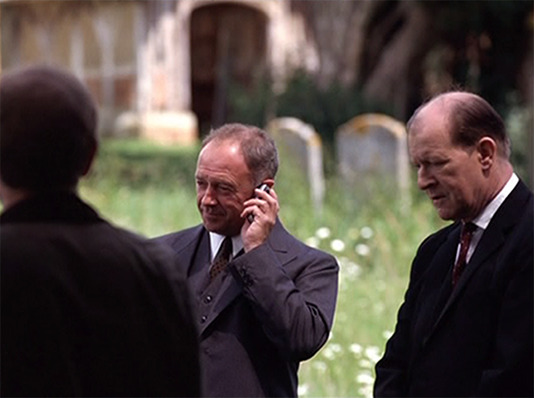 In memory of Alan Howard, whose performance as Stephen Beck in Foyle’s War was among the show’s most poignant. Bringing down Reginald Walker and son – just another of Foyle’s insignificant contributions to the war effort. Foyle’s interview with the mercenary Walkers leaves him skeptical and bemused. LOL. I love both versions. That is how HE makes ME feel. Add a few eye rolls , get the picture? Close, but not quite this manic.